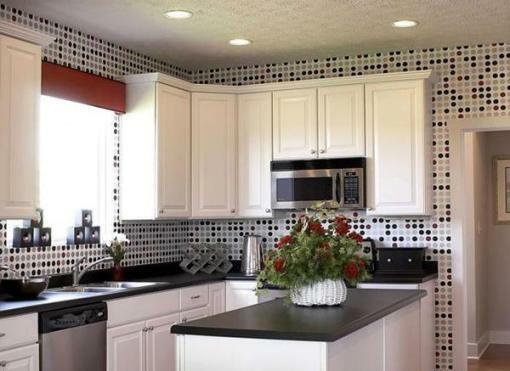 If you want to redecorate the kitchen, now you have it easier than ever. And the fact is that there are multiple economic solutions, simple to carry out and very practical that will allow you to give a new air to this space: do you join the kitchen redecoration? The first of the options that we are going to talk about is the wallpaper. You can find in the market place paper in an overlapping manner to the tiles, so that you can change the style of tiled without even doing a little work. There are until that emulates the marble finish. Changing accessories. Something as simple as change the style of your lamps, accessories or change the set of table and chairs will make your kitchen seems different. A very practical and economic possibility, in addition to simple to modify. Rearrange your kitchen will be doubly useful. Something as simple as introducing shelves or take advantage of the vertical position of the stay will be that you can arrange order all your dishes, glasses and so on, no doubt, something very comfortable that will have an aesthetic component if you insert dishes with small plants or original cooking utensils while that showy, a highly original trend. If there is enough space to do this and do not have a kitchen island, the best thing will be that introduce a furniture of these characteristics. This is something very useful, aesthetic and come in many shapes and sizes, so it will be easier than that you think to end up finding an option that fits your needs. Give prominence to the kitchen roof can also be a great option. Enter plaster mouldings or paint the cast of a different tone in such a way that contrast with the rest of the tiles. Different possibilities that will redecorate the kitchen are something economic and nothing tedious.